From Hawaii’s Maunakea, astronomers around the world use W. M. Keck Observatory to observe the universe with unprecedented power and precision. The twin Keck Observatory telescopes are the world’s most scientifically productive optical and infrared telescopes. Each telescope weighs 300 tons and operates with nanometer precision. The telescopes’ primary mirrors are 10-meters in diameter and are each composed of 36 hexagonal segments that work in concert as a single piece of reflective glass. In the middle of the Pacific Ocean, Hawaii Island is surrounded by thousands of miles of thermally stable seas. The 13,796-foot Maunakea summit has no nearby mountain ranges to roil the upper atmosphere. Few city lights pollute Hawaiian night skies, and for most of the year, the atmosphere above Maunakea is clear, calm and dry -— offering the best seeing on Earth. Click image to view PDF of Strategic Plan or go HERE. The W. M. Keck Foundation funded both the original Keck I telescope and six years later, its twin, Keck II. The project was managed by the University of California and the California Institute of Technology. The Keck I telescope began science observations in May 1993; Keck II saw first light in October 1996. In 1996, the National Aeronautics and Space Administration (NASA) joined as a one-sixth partner in the Observatory. Today Keck Observatory is a 501(c)3 supported by both public funding sources and private philanthropy. The organization is governed by the California Association for Research in Astronomy (CARA), whose Board of Directors includes representatives from the California Institute of Technology and the University of California, with liaisons from NASA and the Keck Foundation. The twin 10-meter Keck Telescopes are the most powerful tools we have to study the cosmos. In addition to offering the two largest light collection mirrors on the planet, the Keck telescopes host a suite of state-of-the-art observing instruments and adaptive optics capabilities to collect and analyze astronomical data with unprecedented precision and clarity. Keck Observatory’s legacy of exploration has contributed to all areas of astronomy and astrophysics — the discovery of exoplanets; the study of how planets, stars and galaxies form; the nature of black holes; and the chemical composition and evolution of the Universe. Although the twin Keck Observatory telescopes offer the greatest potential sensitivity and clarity available in astronomy, their performance, and the performance of all ground-based telescopes, is limited by the turbulence of the Earth’s atmosphere, which distorts astronomical images. The scientists and engineers here at Keck Observatory have learned to remove the effects of atmospheric blurring using an established and fundamental technique called adaptive optics (AO). AO measures and then corrects the atmospheric turbulence using a deformable mirror that changes shape 2,000 times per second. In 1999, the Keck II telescope became the first large telescope worldwide to develop and install an AO system. The results provided a tenfold improvement in image clarity compared to what was previously possible with Keck Observatory and other large, ground-based telescopes. Initially, adaptive optics relied on the light of a star that was both bright and close to the target celestial object. But there are only enough bright stars to allow adaptive optics correction in about one percent of the sky. In response, astronomers developed Laser Guide Star Adaptive Optics using a special-purpose laser to excite sodium atoms that sit in an atmospheric layer 60 miles above Earth. Exciting the atoms in the sodium layers creates an artificial “star” for measuring atmospheric distortions and which the adaptive optics to produce sharp images of celestial objects positioned nearly anywhere in the sky. In 2004, Keck Observatory deployed the first laser guide star adaptive optics system on a large telescope. The Laser Guide Star AO now routinely produces images with greater crispness and detail than those resulting from the Hubble Space Telescope. The Observatory Headquarters is an architecture-award-winning facility located on a 7-acre campus in Kamuela on the Big Island of Hawaii. The land for our headquarters was donated by Parker Ranch. Named by the 2000 Robb Report as one of the 10 most desirable places to live in the country, Kamuela is a charming town of 6,000; it sits 2,500 feet above sea level and offers a peaceful, rural lifestyle, a benign climate, excellent schools, and freedom from the frenetic pace so characteristic of much of the mainland United States. 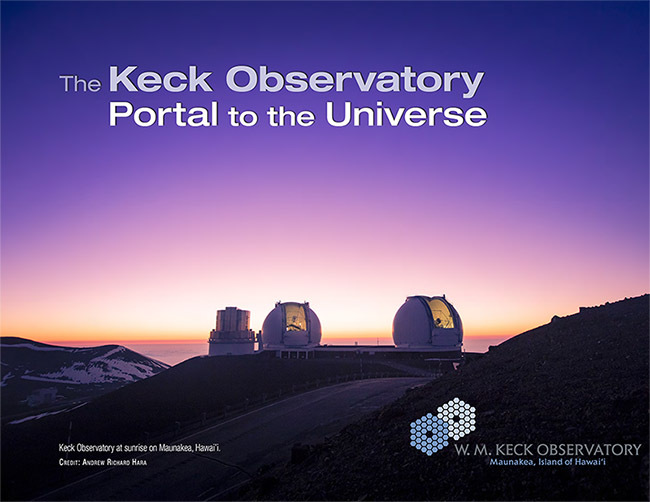 W. M. Keck Observatory is part of the Maunakea Observatories, a collaboration of nonprofit independent institutions with telescopes located on Maunakea on the island of Hawaii. Together, the Observatories make Maunakea the most scientifically productive site for astronomy world-wide. The telescopes on Maunakea are operated by 12 separate nonprofit observatories. Each has its own strengths with varying fields of view and sensitivities to light from radio to ultraviolet wavelengths. They are all important to the scientific productivity of Maunakea. Visit www.maunakeaobservatories.org to learn more about our Maunakea Observatory community.